Salt dough is one of our FAVOURITE crafts to do. You can make all sorts of ornaments out of it and Valentine's Day is no different. 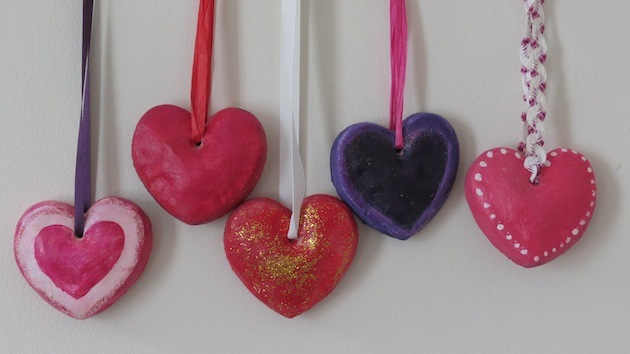 This is one of our valentine kids crafts that children can do together with their friends and take them home ready to hang round the house. 1. You will find our regular salt dough recipe here. 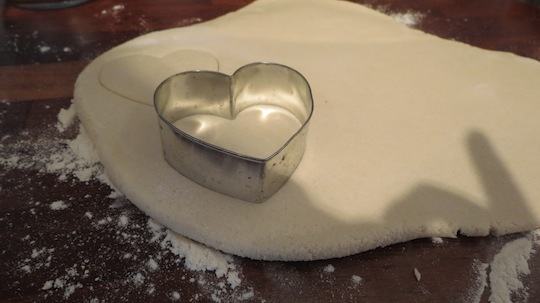 Follow the link and make up your dough and then look at our instruction below for some ideas for valentine salt dough creations! This recipe will make up a good amount of dough. If you only want to make a few ornaments then half the recipe. 2. 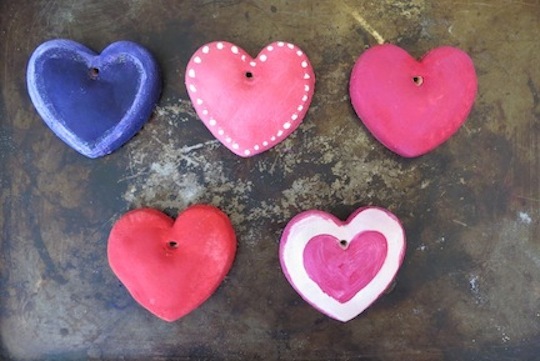 For great valentine hearts use a cookie cutter to make your ornaments. We rolled our dough out to about 1.5cm thick. You don't want it too much thicker or the shapes won't look as good. Make sure you skewer a hole at the top of the heart large enough for a ribbon to pass through. A straw works well. We baked our salt dough at 170C (350F) for 30 minutes and checked regularly that they were not going too brown. This worked pretty well as was really quick - great if time is of the essence. However, if you have the time it's better to bake them slower and at a lower heat: 2-3 hours at 110-120C is best. 3. Once your hearts are out of the oven and cooled start decorating. Here are some of the things we did. 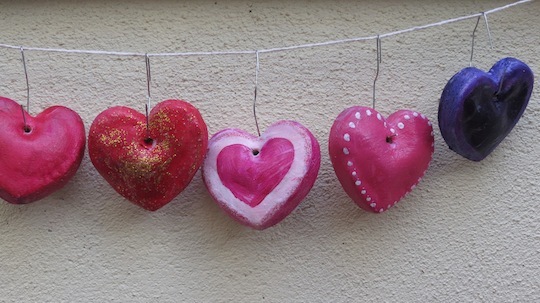 We eventually painted one or two of the hearts with some PVA and added glitter to them as well. You can do what you like though! 4. Now it's time to varnish using clear varnish. This is a job that I did once the decorating was finished and the ornaments had dried throughly (ideally overnight). I hung a string outside and used unbent paperclips to hang the varnished hearts up to dry so they did not stick to anything. 5. Your ornaments are almost done! You just need to thread various coloured scrap ribbon, twine or raffia through the holes so they can be hung up. I raided the scraps box to find what we needed. 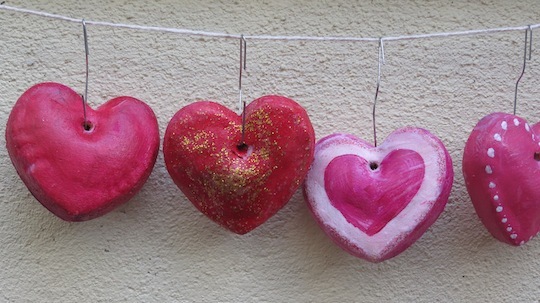 What beautiful valentine salt dough creations! Check out more salt dough ornament ideas here.